The SIRIT fittings for braking systems comply with DIN 2353 regulation. 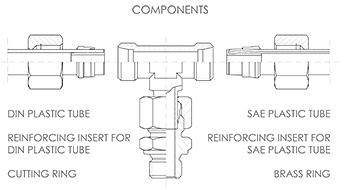 The dimensions and types of fittings shown in this catalogue are based on the requests made by the main European braking systems installers. The range which is particularly extensive, is able to satisfy the requirements of truck, trailers and semitrailers builders as well as those of transformers and spare parts dealers. The working pressures are within the average - low pressure values and correspond to those stated for the light series (L) of DIN 2353. The SIRIT fittings for braking systems can also be used on oil-pressure circuits as long as the pressure does not exceed 250 atm. All fittings shown in this catalogue are supplied zinc plated.